PRESS RELEASE: Sound Technology and Washburn Guitars are pleased to announce the shipping of new Washburn Cracked Mirror models. Due to popular demand the Cracked Mirror top is now available on two production Washburn Guitars. 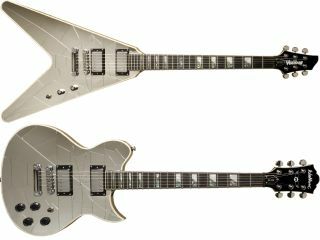 Previously only available on the £7000 USA Custom shop Washburn PS2000 (Paul Stanley Model), this much sought after finish can now be found on the V-shaped WV1800CM and the award-winning Idol-shaped WI1800CM. Both Guitars feature a Mahogany body, set Mahogany neck and striking Split block pearl-abalone neck inlays. A Rosewood fingerboard is included on the WI1800CM model whilst the WV1800CM's is upgraded to Ebony. Both models also include the new Randall pickups, specifically a UL in the neck position and an Ultra XL in the bridge. These new landmark pickups were created in conjunction with Randall Amplifiers to cater to all of the tonal needs of the modern rock or metal guitarist whilst also capturing some of the famous tones of the now legendary Randall MTS modules. As if this wasn't enough, both models also feature the Buzz Feiten Tuning System. Washburn is the only major guitar manufacturer to incorporate the system as a standard feature on production guitars. Both the Washburn WI1800CM and WV1800CM are available now at £713 and £816.50 RRP inc VAT respectively. For more information please visit www.soundtech.co.uk/washburn or call Sound Technology on 01462 480000. Get instant updates and bonus content plus chat with the team Start here!